Everyone loves a one-pot meal. Personally, I’m a huge fan of the one-pan meal. Arrange everything onto a baking sheet, have a glass of wine, and let the oven do the work. Start with a good assortment of late summer veggies. (p.s. how cute are those little round squashes?). 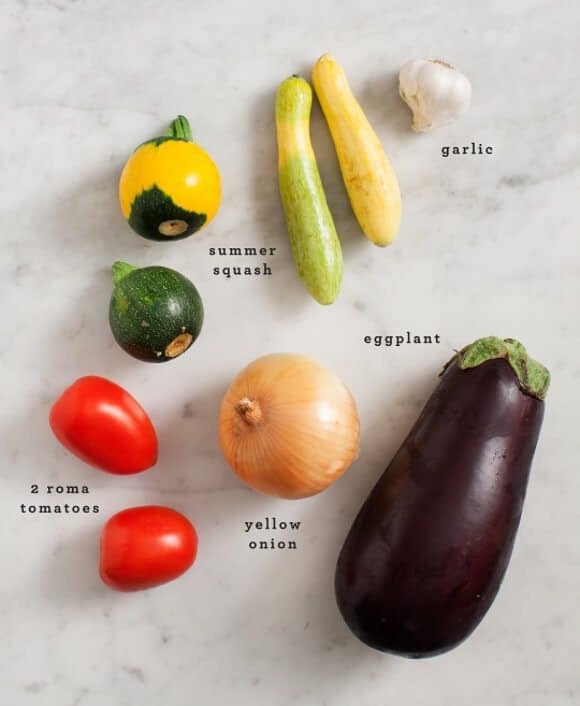 Chop your eggplant, squash and tomatoes so they’re roughly the same size (about 1-inch pieces). Pile everything onto a baking sheet – this time, it’s ok if things are little crowded. Normally, you’d want more space between your vegetables but you want your ratatouille to be a little juicy, so this works. Add a dash of oregano or herbs de provence. Roast until golden, then add a splash of white or red wine vinegar (this gives a nice zing)… toss, and roast just a little longer. Serve with crusty bread, (or in this case I heated up some leftover millet). 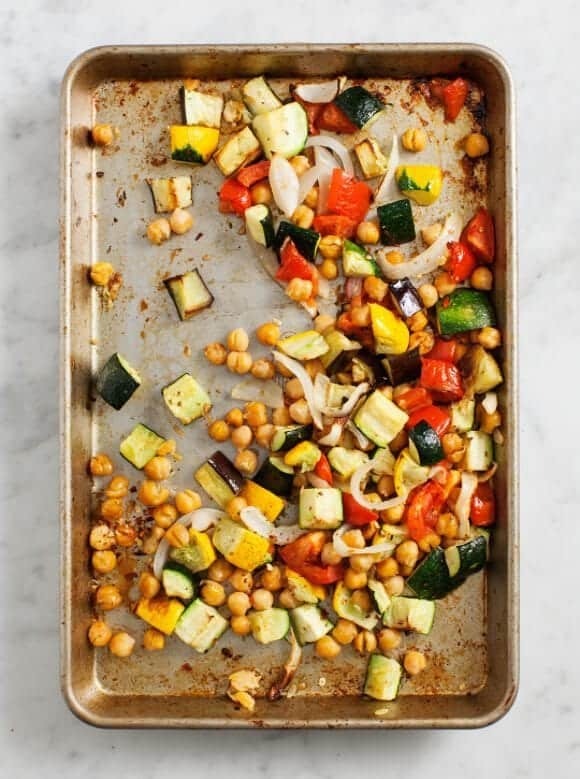 Arrange the eggplant, tomatoes, squash, onions and chickpeas on a baking sheet (it’s ok if it’s a little crowded). Drizzle with olive oil, salt, pepper and oregano. Toss to coat, then bake for 25-30 minutes or until lightly golden brown. Remove from oven. 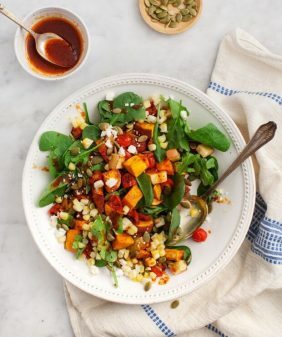 (Still on the baking sheet), drizzle the vinegar over the veggies and toss them with the minced garlic and a few pinches of red pepper flakes. Bake 5-10 minutes longer (or broil 1-2 minutes)… until the veggies are golden brown on the edges but still have somewhat of a bite (you don’t want them completely mushy). Remove from the oven and toss with sliced basil. Taste and adjust seasonings. Drizzle with a little bit more olive oil, if you like. Serve with a grain (or protein) of your choice (millet is pictured). Inspired by the Chickpea Ratatouille Recipe from Mark Bittman’s VB6. Ratatouille is something I always think about but never actually make…or even order at restaurants. It’s such a beautiful dish! I think I need to try this soon. This looks delicious! Loving that cooked millet along the side as well. Yum! I love this. So simple and comforting. My kind of meal!! Yum. I so agree, wine, let the oven do the work and dinner is done! I’m still holding on to the last of zucchini, so this would be perfect. Thanks for this- it’s in my oven now. One thing though- you say to “arrange everything on the baking sheet” which left me having to pick out bits of garlic when I read on to step two. It came out fantastic anyway- this will be my new lazy go-to vege dinner! This looks delicious. Do you mix some of the olive oil with the vegetables before roasting? This was my favorite recipe my grandmother made when I was a kid. Nostalgia! Placing it over cooked millet is a game changer! Love. Chickpeas in ratatouille?! The is the perfect summer to fall transition dish. Oh my gosh, I literally just did this trying to make the best of summer veggies at the farmer’s market. I had all the same veggies plus chickpeas, but added fresh rosemary and basil, drizzled with white wine and a tad bit of liquid smoke and cooked it covered. Wow! I made this tonight with the chickpeas, some of the lingering, small, end-of-season tomatoes from my garden cut in half, zucchini, cabbage, and fennel chunks. 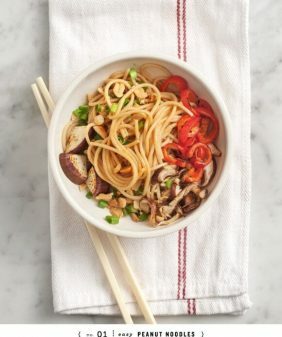 Used balsamic vinegar instead of the white or red wine, and since my son had already asked for some, we had it with whole wheat fettuccine alfredo. It was delicious! Thank you for a wonderful recipe. Sounds easy and delicious! And it looks beautiful. This looks wonderful. I make a similar recipe but never thought to add chickpeas. Love how you make this into a full meal! This is a beautiful looking dish! I love ratatouille. This is a great idea for using chickpeas! I know how to make hummus and I have a lovely recipe for a healthy snack with chickpeas on my blog, but this recipe I will certainly try at home! I love these late summer veggies! I’m still not done ready to be done with summer. This ratatouille seems like the perfect simple end of summer recipe. 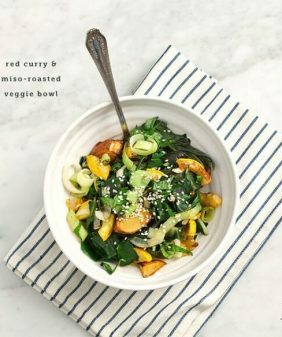 So simply, healthy and delicious! easy and healthy. We love it! 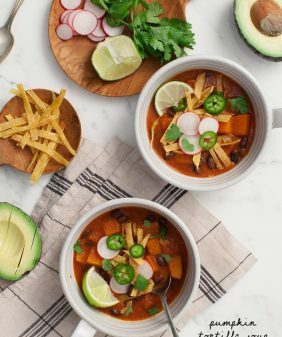 I love the ease of one pot meals too and this looks super colorful and delicious!! I just went in search of some eggplant recipes, having been “gifted” some from my Mom lol! 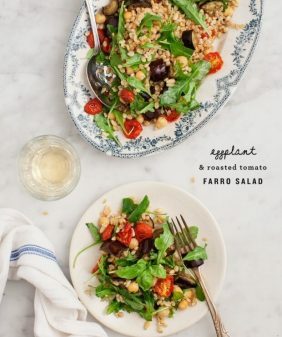 This looks like a great choice for tonight, and I love the addition of the chickpeas in there, one of my favorites. Admittedly, I am not super-confident cooking eggplant since it often seems to turn out too chewy on the outside and a bit too mushy on the inside. I think I’ll try the broiling version first, see how that goes. It was a HUGE hit for dinner last night. . . This looks fantastic! And I’m thinking the leftovers will freeze well for work lunches the following week! Made this tonight, amazing! Tweaked it a little since I couldn’t find eggplant suitable for this. I also didn’t use any vinegar since I just wanted the veggie and spice taste. So I don’t ever comment on things… actually never have on anything. But I tried this dish last night and was blown away. I didn’t expect the recipe to have so much flavor– but it did! The chickpea and red wine vinegar mixture blended so nicely with the rest of this veggie concoction. I thoroughly enjoyed it and advise everyone to try. Hi Catherine – thanks for commenting :). I’m so glad you liked it! I love this! 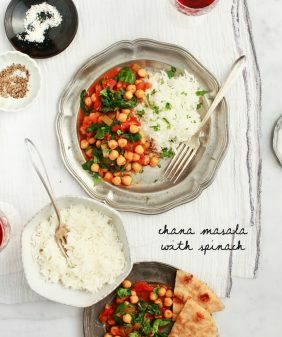 I tried this because I wanted to do something with chickpeas and ever since I have eaten it VERY often! Almost every week! I like to add pine nuts. It is very freezer friendly! This is soooo delicious, easy, and satisfying! I paired the ratatouille with quinoa it was perfect. Also, added mushrooms to the roasted veggies about 15 mins through… very good also. My new fave! This may be my favorite Love and Lemons recipe. After a hiatus at the end of last year’s growing season, I pulled it out for the first eggplant out of my garden. It is even better than I remembered! I modified by adding some green peppers. I lived in France for several years and have a Ratatouille recipe for my Le Creuset Casserole with an eggplant, zucchini and pepper base (and tomato, onion and garlic, of course) that inspired the addition. The roasting and the chickpeas are yummy and give it some extra fullness. My French friends taught me to be liberal with the olive oil — so I may have used more oil than Jeanine’s recipe, but oo la la, it was so good. Hi Jeanine! This ratatouille looks delicious! I’m am deathly allergic to basil, alas. Do you think this dish will taste as delicious without the basil? As a follow up to my last comment: this ratatouille is delicious, even without the basil! My dad (a die-hard lover omnivore) loved it. Thank you! Hi Erica, I’m so happy to hear that you all loved it! Thanks for coming back to let me know! I will be making this recipe. I was wondering did you peel the eggplant or did you dice it with the skin on? Usually when I prepare eggplant I usually peel it. I was looking at the pictures it looks like the skin is on. Hi Diane, I don’t peel the eggplant, the skin becomes tender enough to eat.